On October 31, 1927, a recital took place in the auditorium of the new Little Rock High School which served as a dedication ceremony for the new high school auditorium. The school had been serving students for several weeks by the time the recital took place. The first day of school was Wednesday, September 14, 1927. The star of the recital was Mary Lewis, a Little Rock High School graduate (from the previous location on Scott Street) who had made her Metropolitan Opera debut and become a toast of New York City. The evening started with remarks from former Arkansas Governor Charles Brough, who had made a name for himself as an advocate for education before, during and after his stint in the statehouse. He was followed by Miss Lewis, who sang over a dozen arias and musical selections. For her first encore, Miss Lewis sang “Dixie.” Her second encore was supposed to be “Home Sweet Home.” After several attempts to sing it, she was so overcome with emotion that she had to abandon the effort. For more on the opening event, read Jay Jennings’ excellent book Carry the Rock: Race, Football, and the Soul of an American City. The 1927 schoolbuilding replaced one built in 1905 at 14th and Scott Streets (with an auditorium completed a few years later at 14th and Cumberland). This new building was located in the western edges of Little Rock on what had been city parkland. The former West End Park was now site to Little Rock High School. The adjoining Kavanaugh Field was a baseball field on which Earl Quigley’s football Tigers also played their games. Architects John Parks Almand, Lawson L. Delony, George R. Mann, Eugene John Stern, and George H. Wittenberg (virtually all of Little Rock’s full-time working architects at the time) designed the $1.5 million structure, which the New York Times dubbed the most expensive school ever built in the United States at that time. Featuring a combination of Collegiate Gothic and Art Deco architecture, Central High spans two city blocks, comprising over 150,000 square feet of floor space, upon its completion. Requiring 36 million pounds of concrete and 370 tons of steel, the finished product consisted of 100 classrooms (accommodating over 1,800 students), a fireproof 2,000-seat auditorium, a gymnasium, and a greenhouse. The six-story structure (counting the bell tower and basement) features a middle section containing the auditorium with four classroom wings (two per side) flanking a reflection pool in the foreground of the building. Faced with brick, the building’s highlights include pilasters and colonnades of cut stone, double-hung window frames with twelve lights per sash, and a main entry terrace supported by a colonnade of five masonry arches rising above Corinthian columns of stone. 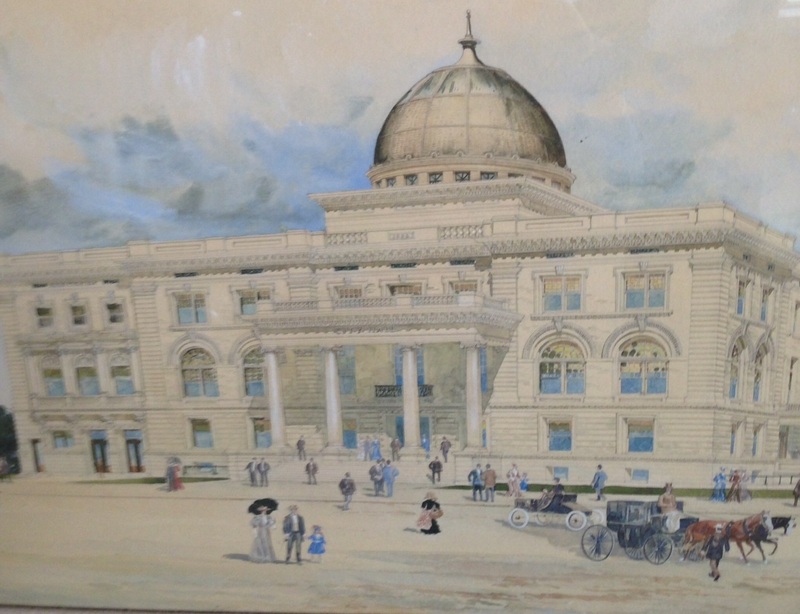 Little Rock Look Back: Plans Approved for new City Hall in 1906. But will it be built? The 1906 plans for City Hall with the Municipal Auditorium on the left portion. On July 9, 1906, the Little Rock City Council approved Resolution 281 and Ordinance 1,295. These actions approved the plans for a new City Hall complex to be constructed on land at the northwest corner of Markham and Broadway Streets. A few days later, the contract was awarded for the construction of the new building. Mayor Warren E. Lenon had first called for a new city hall complex in his annual address in April 1904. He repeated his request in April 1905. The City Council took up Mayor Lenon’s quest for a new city hall in December of 1905. The Council appropriated money for the purchase of land for a city hall, jail and auditorium. In response to this, the Arkansas Gazette daily newspaper ran a story featuring the viewpoints of a few civic leaders weighing in on the need for a new city hall complex which would also include a new jail and a city auditorium. Two of the respondents, L. B. Leigh and P. Raleigh, stressed the need for paved streets and better sewers instead of a new city hall and auditorium. The other three businessmen interviewed were more favorable to Mayor Lenon’s proposal. Morris M. Cohn, a former Little Rock City Attorney, stated “I do not think we can make a better investment than in a fine city hall and auditorium.” (Mr. Cohn, though an M. M. Cohn, was not related the M. M. Cohn who was the namesake for the longtime Little Rock department store.) County Judge William Marmaduke Kavanaugh offered his satisfaction with the action of the City Council on that matter. R. E. Walt, a banker, opined that he thought $150,000 was not enough; he suggested $200,000 should be spent. As 1906 dawned, Mayor Lenon and other city leaders continued to take steps to build the new city hall and auditorium. They invited three local architects to make presentations for the chance to design the new complex. The three were Charles L. Thompson, Frank W. Gibb and George R. Mann. Mr. Thompson was chosen to receive the assignment. On February 5, 1906, Mayor Lenon announced the creation of a special committee to work on the planning for a future city hall complex. This committee consisted of Aldermen Louis Walther, A. B. Poe, L. N. Whitcomb, Christopher Ledwidge, and John A. Adams. The saga to get the building built was just starting. The evening started with remarks from former Arkansas Governor Charles Brough, who had made a name for himself as an advocate for education before, during and after his stint in the statehouse. He was followed by Miss Lewis, who sang over a dozen arias and musical selections. For her first encore, Miss Lewis sang “Dixie.” Her second encore was supposed to be “Home Sweet Home.” After several attempts to sing it, she was so overcome that she had to abandon the effort. Architecture is often overlooked when considering the arts, but it is definitely an art form. Built in 1927 as Little Rock Senior High School, Central was named “America’s Most Beautiful High School” by the American Institute of Architects. The New York Times called it the most expensive high school built at the time. Designed as a mix of Art Deco and Collegiate Gothic architectural styles, the building is two city blocks long and includes 150,000 square feet of floor space. The project involved most of Little Rock’s leading architects who were still practicing at the time: John Parks Almand, George H. Wittenberg and Lawson L. Delony, Eugene John Stern, and George R. Mann. Over the years, different architects would take credit for various facets of the building. Given the size of the project, there was plenty of work for each architect to do. More than 36 million pounds of concrete and 370 tons of steel went into the building’s construction. The building contained 150,000 square feet of floor space, upon its completion. It cost $1.5 million to construct in 1927. The school received extensive publicity upon its opening. An article in the Arkansas Gazette said, “we have hundreds of journalists in our fair city for the dedication” of the new high school. At its construction, the auditorium seated 2,000 people between a main level and a balcony. The stage was sixty feet deep and 160 feet long so that it could be used gymnasium. From 1927 until the opening of Robinson Auditorium in 1940, the auditorium would be Little Rock’s main site for hosting performances by musical and theatrical groups. Subsequent additions would include a separate gymnasium, a library, and a football stadium. In 1953 the school’s name was changed to Little Rock Central High School, in anticipation of construction of a new high school for students, Hall High School. In 1977, the school was listed on the National Register of Historic Places, and it was designated a National Historic Landmark in 1982. These were in recognition of desegregation events which took place in the school in 1957. The monthly architectural history program “Sandwiching in History” visits the Albert Pike Memorial Temple, located at 712 Scott Street. The program begins at noon today. A historian with the Arkansas Historic Preservation Program delivers a brief lecture about the church before leading guests on a tour. Completed in 1924, the three-story, Classical Revival-style temple was designed by George R. Mann and Eugene John Stern for the Ancient and Accepted Scottish Rite of Freemasonry. In 1952 a fire damaged the southern end of the building, which was rebuilt and rededicated in 1956. The building’s monumental front facade, which encompasses an entire city block, is lined with nineteen Ionic columns. The interior features beautifully decorated spaces with ornate plaster molding, stained-glass windows, and pink and gray marble. Sandwiching in History is a program of the Arkansas Historic Preservation Program, an agency of the Department of Arkansas Heritage. The AHPP is responsible for identifying, evaluating, registering and preserving the state’s cultural resources. Other DAH agencies are the Arkansas Arts Council, the Delta Cultural Center in Helena, the Old State House Museum, the Mosaic Templars Cultural Center, the Arkansas Natural Heritage Commission and the Historic Arkansas Museum. 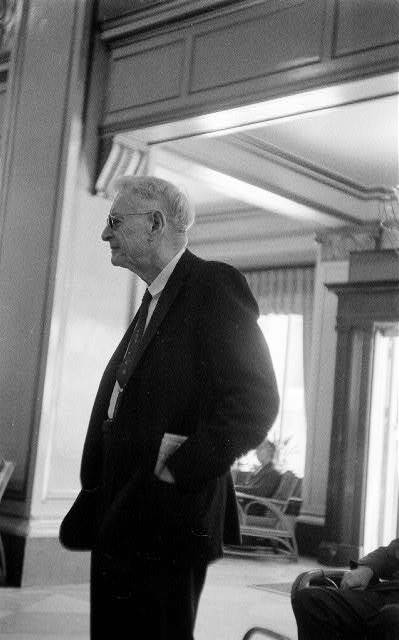 At the age of 87, J. N. Heiskell in 1960. John Netherland (J. N.) Heiskell served as editor of the Arkansas Gazette for more than seventy years. He was born on November 2, 1872, in Rogersville, Tennessee, to Carrick White Heiskell and Eliza Ayre Netherland Heiskell. He entered the University of Tennessee at Knoxville before his eighteenth birthday and graduated in three years at the head of his class on June 7, 1893. His early journalism career included jobs with newspapers in Knoxville and Memphis and with the Associated Press in Chicago and Louisville. On June 17, 1902, Heiskell’s family bought controlling interest in the Arkansas Gazette. Heiskell became the editor, and his brother, Fred, became managing editor. Governor George Donaghey appointed Heiskell to succeed Jeff Davis in the United States Senate after Davis’s death in office. Heiskell served from January 6, 1913, until January 29, 1913, when a successor was elected. On June 28, 1910, Heiskell married Wilhelmina Mann, daughter of the nationally prominent architect, George R. Mann. The couple had four children: Elizabeth, Louise, John N. Jr., and Carrick. In 1907, he joined a successful effort to build the city’s first public library. He served on the library board from that year until his death and was issued the first library card. He also served on the City’s Planning Commission for decades. In 1912, he was instrumental in bringing John Nolen to Little Rock to devise a park plan. Heiskell was also largely responsible for the location of Robinson Auditorium. When City Council members had competing locations, he advocated for the corner of Markham and Broadway. And kept at it until the site was selected. In the paper and in his own personal opinions, he crusaded on a variety of progressive causes. Perhaps the most famous was the Gazette’s stance in the 1957 Central High desegregation crisis. It was for this effort that the paper received two Pulitzer Prizes. A few weeks after turning 100, Heiskell died of congestive heart failure brought on by arteriosclerosis on December 28, 1972. He is buried in Little Rock’s Mount Holly Cemetery. Interestingly, he is buried in the same cemetery as two of his most notable adversaries: Governor Jeff Davis, and segregationist Congressman Dale Alford.